Can the lifestyle component in Singapore keep up with New York and other major cities? Sometimes it is almost unfair to compare it to New York. Nowadays, there is always something going on in Singapore. However, plenty is operating on a repetitive formula, meaning you know exactly what to expect. In New York, walking every ten blocks is already an adventure. In New York, people are really trying to get out of the box and be original, while in Singapore I feel the majority still go by a certain formula that simply works instead of taking creative risks. Singapore’s F&B scene has changed a lot in the last years – restaurants are getting more sophisticated, concept dining and bars are turning bespoke. How do you see this development? What’s great is that while the F&B scene has changed a lot, local food culture is still king – it’s what Singaporeans still crave most, and why tourists come to Singapore. As for the changes in the international cuisine, just 10 years ago, the only ‘trendy’ and well established restaurants were fine-dining French restaurants. But globally there has been a shift away from white-table cloth service, and it can be seen in Singapore as well. People are interested in something more personal and bespoke, people are curious about other cuisines, and they want to know where their ingredients are from. Chefs started becoming stars. In Singapore, Marina Bay Sands did help kick start the ‘celebrity restaurant’ scene a few years ago, but now we’re seeing countless independent restaurant start ups that are bringing in concepts from Australia, Europe, and Americas. And where do you see the scene heading next? It might not need more cocktail bars. It was really great when all these Western concept places like specialty coffee cafes, taquerias, tapas bars, cajun cuisine, and such started to open up, but I think the peak of this trend was a 1,5 years ago – I believe Singapore was even surpassing Hong Kong in terms of international cuisine offerings and quality. But where is it heading next? In New York, for example it’s very cool to be able to know how to cook at home at the moment. But I also see the scene heading back to street food, but reinvented in some way. Yes, food trucks are big in the States, but you won’t see that happening here for a variety of reasons. It would be nice to see Asian food become cool again. I guess that hasn’t really been done here in a big way; it is usually all about Western cuisines being trendy. Funny though, that what is actually big in New York right now are Asian cuisines – grass is always greener on the other side, right. New restaurants and bars are opening up every week. However, not all survive. 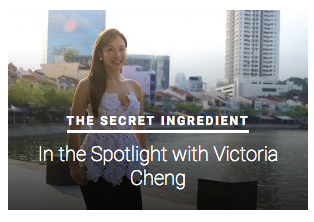 Observing the scene for a while, what do you think is key to make it in Singapore’s F&B scene? It’s like in any big city, an owner can’t solely rely on his friends coming to his bar or restaurant. You need to cater to a wider audience. If it’s going to be niche, then you have to be aware of the challenge. Most people don’t understand the amount of capital that is required to sustain your bar over the first three years. A dose of luck is good, but you need to understand how much work you will have to put into it. If you have the right capital, but you aren’t there or don’t have the right people on the ground, then it’s just going to fall apart. Location, consistency and service are key too. If you don’t have good service, you better have damn good quality in whatever it is you are serving. I just found a producer and we are partnering up to create a whole food-related video series at Gastronommy and for various editorial partners who want to incorporate video into their lineup. This will encompass much more than a simple restaurant review – we want to share real stories, real information in a tongue-in-cheek kind of way. As much as I love writing and will continue to do so on the side, we need to keep up with the times and move beyond print and television. The average person consumes information in a very different way today, so we are pushing more into the digital front. The series will roll out at the end of July.